Last week I wrote a long and rambling dissertation on cognitive dissonance. Brilliant as that dissertation was, I thought that today, rather than spouting psychobabble, I would give you some actual numbers. Yup, actual on the ground research. (Then I will finish with more psychobabble). 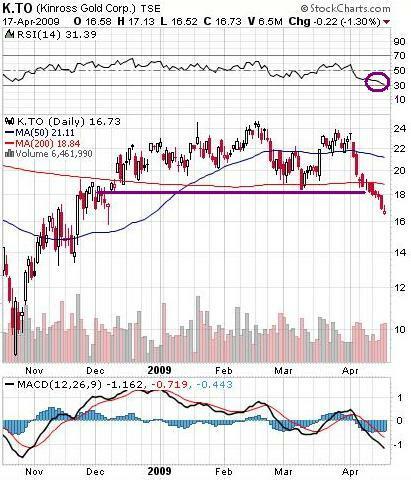 In my commentary on October 11, 2008 I told the story of traveling to Toronto to buy gold and silver, only to find out that both commodities were in short supply. I had attempted to buy 100 one ounce Silver Maple Leaf coins (worth about $12 U.S. each) at Scotiabank in downtown Toronto (the largest precious metals dealer in Canada). I was told that supply was limited; they could only sell me 25 coins. I was shocked that I could not even spend $500 Canadian on silver coins. This week, I decided to repeat the test. On Tuesday off I went to Toronto, I walked up to the precious metals trading desk, and asked to buy 100 one ounce Silver Maple Leaf coins. No problem, I was told. How about gold Maple Leafs? No problem, we’ve got them. It would appear that the significant shortages in gold and silver coins are not as significant as they were a few months ago. As for prices, back in October a one ounce Silver Maple Leaf cost $19.87 Canadian. (Coins are priced in U.S. dollars per ounce, so the price includes the conversion to Canadian currency, the 8% Ontario Sales Tax, and the bank’s commission. The price varies slightly depending on the quantity you buy). This week that same one ounce Silver Maple Leaf coin cost $23.01 Canadian, an increase of 16% over a six month period. The actual price of a one ounce Gold Maple Leaf coin increased from $1,181.33 Canadian to $1,276.14 Canadian, or an increase of 8% over that same six month period. During that time the price of gold has increased from roughly $825 US an ounce to $892 an ounce, for an increase of 8%. Silver’s increase has been from roughly $10 to $13 US per ounce, or a 30% increase. So what does this all mean? It means precious metals are up in the last six months, with silver up more than gold. They were a good investment. By contrast, six months ago the Dow was around 8,600, and today it’s around 8,000, for a drop of about 8%. Of course had I asked for these same quotes on Friday the prices would have been cheaper, as gold and silver tumbled later in the week. However, the basic point is that gold and silver, expressed in Canadian dollars, were a better investment over the last six months than the Dow. Which of course is one of the main reasons that physical silver and gold is the ultimate insurance policy. If you draw an uptrend line from the lows of November 2008, it hits where we are today. Coincidence? Perhaps. But the 200 Day Moving Average is $860.37, and gold closed on Friday at $869.10, so it’s possible that both the uptrend line and the 200 DMA are support levels. Looking a the three month chart the $860 level also looks like support, and the RSI is as low as it’s been in months, so again, a bottom could be here. 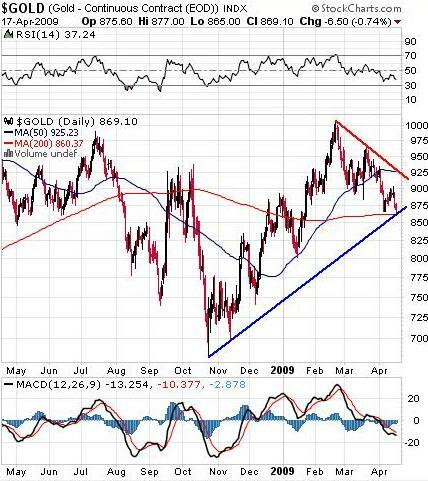 If gold breaks below $850 this week, I will assume that we are going for a big fall. If not, we could be at a decent support level, so now may be a good buy point (although I will wait and see before committing any further cash). Looking at the gold stocks, they are looking beaten down. For example, K.TO – Kinross Gold Corp. closed the week at $16.73, a big drop from the $24 level we hit back in January, February and March. 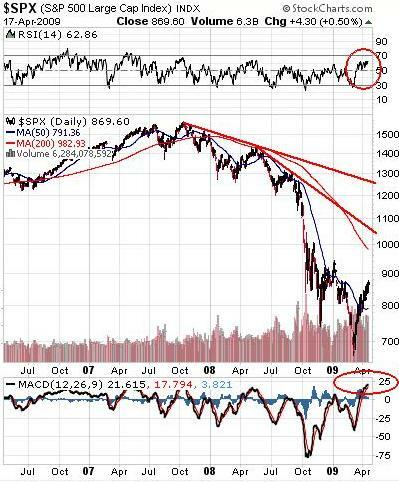 The RSI at 31.39 is also very low. Is this a breakdown with a big fall ahead, or is this a “breakdown” that was artificial, like we saw back in November, that was in hindsight a fantastic buying opportunity? I won’t bore you with the charts, but the charts of AEM.TO – Agnico-Eagle Mines Ltd. and G.TO – Goldcorp Inc. and other gold stocks look remarkably similar. Gold itself has not broken through it’s base, but the gold stocks have, which either means they have over-corrected and are due for a bounce, or bad things are coming. In fact, even the silver stocks look the same (SLW.TO – Silver Wheaton Corp. and PAA.TO – Pan American Silver Corp., for example). Again, it appears to me we are at a significant decision point. 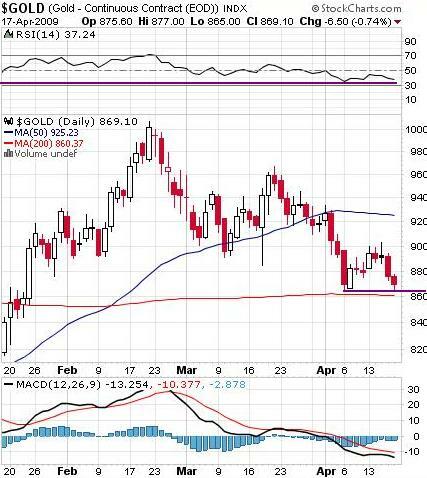 If these levels in gold and silver hold, we may be at a near term bottom. If they don’t, we could easily see $800 per ounce gold; we will have a good idea this week, and a very good idea before the end of the month. How is the overall market doing? Hard to say. As this 3 year chart of the S&P 500 index shows, we are still in a downtrend, and the RSI and MACD are getting into over bought territory. Not good. Shortening the time period, the one year chart shows a series of lower highs and lower lows; obviously a market going down. Again, it appears to me that we are at a critical level in the overall market. A decisive break above the 875 level and we could see a nice run upward. 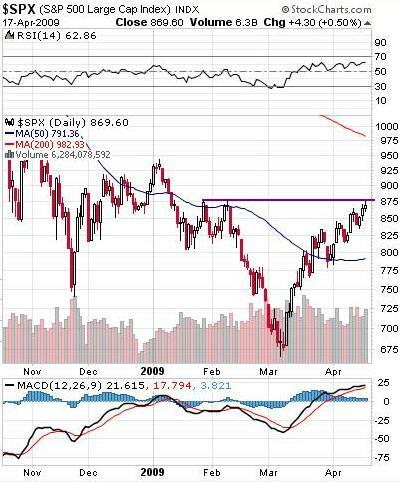 If, however, the market doesn’t get above these levels, the chart will be a double top or a triple top, and back down we go. My thoughts are well documented on where we are going from here: Bear market rallies are commonplace. 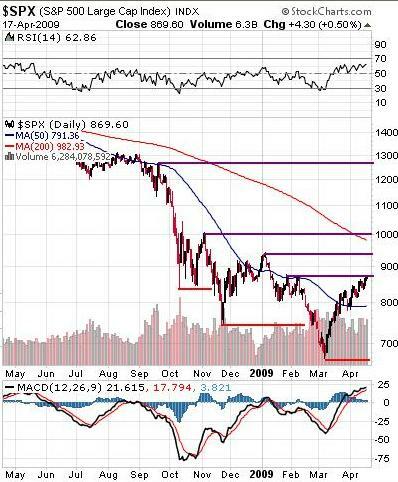 But, I believe we are still in a bear market, and until we have retested the lows we won’t start a new bull market. I believe we will retest the lows, and go lower. I am in the bear camp because although we have had the sub prime crisis, and the residential real estate crisis, we have not yet had the commercial real estate crisis (although it’s starting; the second largest mall operator in the U.S. went bankrupt this week), and we have not had the credit card crisis yet. Unemployment remains high, no-one is buying cars (or much of anything else), so I believe that fundamentally we have a way to go down yet. Am I buying puts on the S&P? No, I’m simply holding a lot of cash, and staying on the sidelines until the direction becomes more clear. For more on the current depression, I have more psychobabble comments below. For those who only want to read about investments, you can stop reading now, thanks for reading, see you next week. Two stories for you this week. First, the story of my nephew, a 17 year old high school student who has spent the last eight months looking for a summer job, which is not easy to find in these depressionary times. He knocked on every door in town, and sent resumes to literally hundreds of places. Finally he got an interview at a local store a ten minute walk from his home. The owner said he fired the last student employee because he wouldn’t clean the washrooms. My nephew said “that’s no problem; my older brother and I are responsible for cleaning our own bathroom, and he’s a bit of a slob so I end up doing most of the cleaning, so I’ve got no problem doing it.” He got the job. He got the job because he was lucky to have the right response to the right question when asked. But his luck was caused by knocking on a 1,000 doors to put himself in a position to get lucky. I believe it was Samuel Goldwyn who said “the harder I work, the luckier I get”. I couldn’t agree more. I fear that “kids today” want the fancy car, the big screen T.V., and the big house, but they don’t want to work for it, primarily because their parents have those things. Unfortunately their parents bought all of those things on credit; some of them didn’t work for them either, which is one of the contributing factors to the credit crisis today. Yes, I am fostering a stereotype by talking about “kids today”. In fact, I don’t believe that “kids today” are the problem. I think the current crop of teenagers and 20 somethings will be more responsible and hard working than their forty and fifty year old parents. (I turn 45 years old this year, so I can speak with authority on the mind of a 45 year old). The 35 to 55 age group grew up in an age of credit cards, car loans, and high ratio mortgages, so a great deal of our consumption was debt driven, not work driven. My father, who is 72 years old, had a mortgage, but he never had a car loan, and never carried a balance on his credit card. He paid cash. His parents, who were in their 30s during the Great Depression (you know, the first one), always paid cash, because that’s all there was. My nephew, and my children (who won’t be teenagers for another three or four years) will not have access to the same easy credit that my generation enjoyed. They will have to work for what they want, and save for big purchases. Long term that’s a good thing, because are efforts lead to our rewards, and we will not be beholden to a banker who decides to raise our interest rate or cancel a loan. Short term that will really squeeze the economy, since there will be fewer buyers. (Which is another reason I’m in the bear camp). Regardless, I’m proud of my nephew. Learning at the age of 17 that hard work and persistence pays off is a great life lesson. My second story is the thoughts of Peggy Noonan, who wrote in the Wall Street Journal about a “new” trend toward self sufficiency, and away from outward displays of affluence. I agree. If I need less, I can work less. If my family can get by with one car instead of two, I don’t need to work two jobs. I can actually see my family more, which is also a good thing. So, in keeping with these difficult times, I am off to take advantage of the first sunny warm Saturday this year here in Southern Ontario, and I am going to turn over my vegetable garden. Today I plant peas, and probably some spinach and other frost tolerant crops, and get the garden ready for the heavy planting next month. I like vegetable gardening. It’s good exercise, I get to each fresh food, and it takes my mind off terms like RSI, MACD, bankruptcy, and bear markets. Enjoy it while you can, thanks for reading, and see you next week.